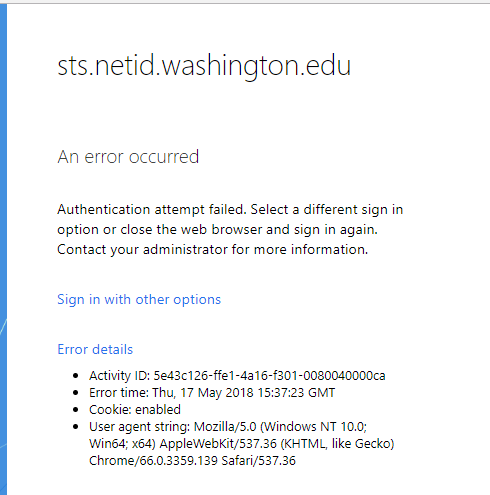 ADFS and Office Modern Authentication, What Could Possibly Go Wrong? We’ve recently thrown the load balancer switch to send users to our new ADFS 4.0 farm rather than the old ADFS 2.x farm. My first baby steps in this process were documented in a prior post.1 It turns out that was just the beginning of this long, tortured journey. Things got very complicated when we started getting errors from users of Outlook hitting our Office 365 Exchange Online. In my prior post I explain how SAML Tracer can be helpful. However, you can’t use a browser-based HTTP debugger/tracer with a thick client like Outlook. In these cases Fiddler is your friend. Many of the Office 2016 apps (and some of the Office 2013 apps with the right updates and registry settings) can use what Microsoft likes to call Modern Authentication. This is nothing but a lame pseudonym for OpenID Connect. OIDC, as it is abbreviated, uses a web-API friendly exchange to authenticate users. This is in contrast with the older and well established SAML and WS-Trust authentication protocols which are SOAP-based. We don’t (yet) use MFA with Office 365 so the settings I discussed in the prior article don’t apply to it. Older versions of the Office thick clients use basic authentication with Office 365. The app puts up a credential dialog and then sends the user’s credentials to the O365 service where the actual authentication against Azure AD takes place. The user credentials are protected by TLS. This means that the user has to enter their credentials each time they start the app unless they choose to have the credentials stored locally. The biggest downside to this is that those locally stored credentials can easily be harvested by malware. How does OIDC change the authentication flow? Newer Office apps open a window that hosts a browser which the app directs to the address of the OIDC provider (OP) configured during auto-discovery. The OP puts up a web form to collect the user’s credentials and, after validating them, returns two JSON web tokens. One is an app authentication token, the other is a refresh token which can be used by the app to request a new auth token when the current one expires. Thus the user’s credentials are never stored locally. The app and refresh tokens could be replayed but they are bound to the app so their loss would be far less damaging. The Office 365 OP is the familiar https://login.windows.net and/or login.microsoftonline.com which both sit in front of Azure Active Directory (AAD). Things get more complicated when ADFS is in the mix and it really is a bit of a mess when your ADFS is using a SAML Claims Trust Provider (CTP). 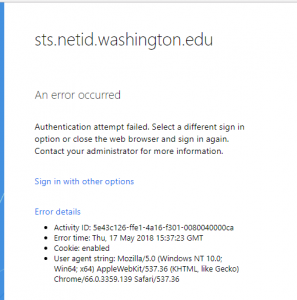 The UW, like many higher-ed institutions, uses the community developed Shibboleth SAML IdP and our ADFS is configured with it as the CTP. This means we get an authentication flow that transitions between 3 different protocols. The initial step from the Office app uses OIDC. AAD then calls ADFS using WS-Trust. ADFS then translates the WS-Trust call into a SAML protocol call to Shibboleth and the whole process unwinds as the security tokens are returned.2 As you can see there are lots of places where things can go haywire. Our first sign of something amiss was users reporting this error when they attempted to sign on after the switch to ADFS 4.0. Ah-ha, there is an Activity ID. I can look that up in the ADFS event logs to get more detail. Except that the logs didn’t say anything other than there had been an authentication failure. Not very helpful. Here is where breaking out Fiddler becomes necessary. As an aside I recommend running Fiddler from an otherwise unused machine because it captures all network traffic. Your typical workstation is going to be way too noisy which will clutter the network capture with lots of extraneous traffic. I use a virtual machine for this purpose so that nothing is running other than the app (usually Outlook) and Fiddler. ADFS then sends this same URI as the SAML AuthnContextClassRef to Shibboleth. This parameter value is not a part of the SAML spec so Shib returned an error and ADFS then displayed its error. If you recall from my prior post there is an ADFS CTP property called CustomMfaUri that gets applied in the MFA case. Unfortunately Microsoft did not create a corresponding non-MFA property. I’ve asked them to consider creating a CustomDefaultUri property. We’ll see if that gains any traction. At this point I called Microsoft Premier Support to find out what, if anything, could be done to fix this. The support engineer took a look at the Fiddler trace and pointed out something I hadn’t noticed. Outlook 2016 was adding a “prompt=login” parameter to its OIDC login request. AAD translates this into the WS-Trust wauth parameter. He told me that this AAD behavior is configurable and that I should follow example 3 of this article https://docs.microsoft.com/en-us/windows-server/identity/ad-fs/operations/ad-fs-prompt-login. That indeed fixed the issue. Wauth is an optional WS-Trust parameter. Password authentication is the default in the absence of this parameter. The SAML AuthnRequest created by ADFS when there is no wauth has no AuthnContextClassRef so Shib also defaults to password authentication. Our celebration of success was short-lived as other users continued to have similar login problems. What we discovered is that different versions of Office and Outlook 2016 have different “modern auth” behavior. The click-to-run version downloaded from the Office 365 site sends the prompt=login parameter. However, the MSI volume licensed version we distribute to campus is an older build of Office 2016 and it instead sends a different OIDC parameter: “amr_values=pwd”. There is no AAD property to configure the behavior with this parameter, it results in the above wauth being sent to ADFS. As far as we can tell there is no update that can be applied to the MSI version to have it change its behavior to send the “prompt=login” parameter. At this point the MS support engineer had no suggestions. The Shib team made the change and now things are working properly. To quote Jim the lead engineer “We frequently have to make accommodations for vendor apps that are not spec compliant.” A better solution would be for Microsoft to more fully support SAML-spec IdPs as CTPs. Another solution would be to do password hash sync from AD to AAD so that AAD could handle the login without ADFS or Shibboleth in the mix. However we are concerned about introducing a second login portal to our campus users. We have enough of a problem with phishing and this would only complicate matters. We’ll see which way we end up going. MFA can be requested at any step in this authentication chain: at AAD, ADFS, and/or Shibboleth. Requesting it in AAD via, say, conditional access, provides the finest grained control. Fiddler hint: you have to configure Fiddler to Decrypt HTTPS traffic in order to see the body of the HTTPS transactions. When you do so, Fiddler adds several self-signed certs to the certificate store and this causes havoc with some browsers who are trying to detect SSL man-in-the-middle attacks. Fiddler essentially is doing a man-in-the-middle. Another good reason to use a VM for this. See https://docs.oasis-open.org/security/saml/v2.0/saml-authn-context-2.0-os.pdf for the complete list of SAML defined Authentication Context Classes. P.S. We didn’t have this problem with ADFS 2.0 because we modified the Home Realm Discovery page IIS code to rewrite the URL with the proper wauth values. You can’t do that with ADFS 4.0 (or 3.0). This entry was posted in Active Directory, Identity and Authentication and tagged ADFS, authentication, azure on June 11, 2018 by Eric. Thanks for the nice write-up, we are running into the same issues here with Shibboleth serving as the CP to the O365 relying party in AD FS. We did change the MSOL federation settings to “NativeSupport” and that seems to have worked for most use cases but I am concerned about some of the legacy apps that you mentioned were not working after making that change. Do you have any details about what needs done on the Shibboleth side of things so that Shibboleth will accept the Microsoft authentication context class (http://schemas.microsoft.com/ws/2008/06/identity/authenticationmethod/password)? Thank you for the great write-up and thorough explanation. Does the Exchange environment (on-prem, hybrid, or pure office 365) impact the configuration? Is there any additional configuration needed if 2013 clients with modern auth are in the mix? I’m not really an Exchange admin so I don’t know if on-prem Exchange does OAuth/OIDC. I suspect it doesn’t since it would require ADFS to handle the auth. We are running hybrid but we’d like to switch to full EO native due to no longer having any on-premise mailboxes. Unfortunately MS does not have a supported way to transition from hybrid to cloud native. This has me rather baffled due to MS having the “cloud first” marching orders. We’d love to be able to shut down our remaining Exchange boxes. As for Office 2013, you get “modern auth” to EO if you have the latest updates and set a registry setting. Once that is done I believe it behaves the same way as the MSI version of Office 2016.